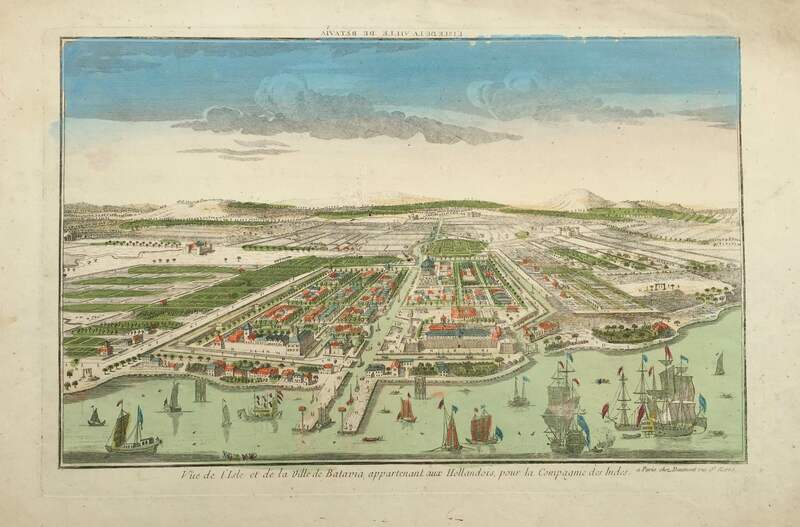 Antique print Old Batavia by Daumont titled ‘Vue de l’Isle et de la ville Batavia appartenant aux Hollandois, pour la Compagnie des Indes’. 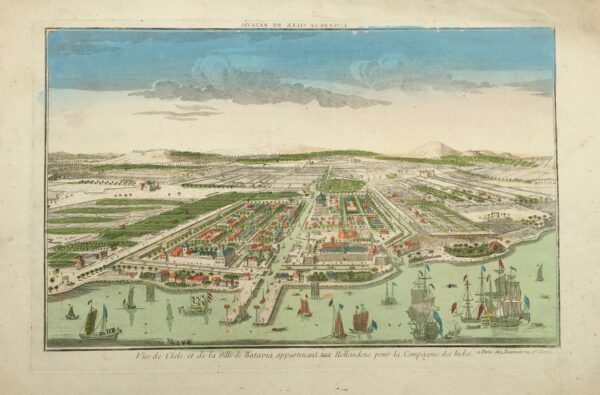 An attractive hand coloured so called optical print of the old Batavia. Published by the well-known Paris publisher Daumont after a design of Jan van Ryne in 1754. Van Ryne was born in the Netherlands, but spent most of his professional life in London, where he specialized in the production of engravings of scenes of British and Dutch colonies. Located at the mouth of the River Ciliwung, Jakarta was the site of a colony and a port that dates back perhaps to the fifth century AD In 1619 the Dutch took and razed the existing city of Jayakerta (meaning “glorious fortress” in Sundanese) and built the walled city of Batavia, which became the capital of the V.O.C. Perspective views (vues d’optique) were a special type of popular print published in Europe in the 18th century. These prints provided a form of entertainment when viewed through a device called an ‘optical machine’ or ‘optique”, a forerunner of the modern slide projector. The most characteristic feature of the perspective views is their emphasized linear perspective, done to intensify further the enhanced appearance of depth and the illusion of space in the prints when viewed through an optique. Another attribute of these prints is their bright, often crude hand colouring, applied boldly so as to show the tints when viewed through the lens. In very good condition, measures: 24,6 x 39,2 cm.